Excellent and luxury ski apartment in Avoriaz with 3 bedrooms. Located directly on the piste, ski in and out! Perfect for 7 persons ( plus 2 more in living room). Thanks to its location the best view of Avoriaz! COMPLETELY REFURNISHED in 2018, 3 bedrooms, 2 bathrooms. In the center of the largest ski area of Europe! 5 minutes (covered) walk to kids ski school, shops and restaurants in the centre. Modern kitchen with dishwasher, oven, microwave, cleaning room with washer and tumble dryer. Free WiFi and 2 LCD HD TVs. My name is David de Graaf, married and having 3 kids, owner of the villa (together with my wife Christine). My profession is management consultant and interim manager and partner of a consultancy company. Hobbies are regatta sailing, golf and ski. We visit already 20 years the Portes du Soleil, a fantastic area in both winter and summer. The combination of simple and very challenging slopes suitable for our family and friends. For skiing and snowboarding. The apartment is ideally located with beautiful views and the shops, restaurant and several ski schools are within 5 minutes walk. The apartment is very comfortable and fully equipped. Due to the good insulation and heating a comfortable place. From the front door within 3 minutes on skis! The availability of 3 bedrooms makes it perfect for our family together with friends. We love good food, the presence of multiple excellent restaurants is therefore essential.The views are realy outstanding ! Bathroom 1 with shower and bath, bathroom 2 with wc and shower. Plus extra room with WC and washing machine. Dining table for 7 people, sofa and chairs, 2 flatscreen LCD TV's, video, wifi. Ipod connection. Dishwasher, cooker, microwave and grill, fridge, freezer. Direct on the slope. You can directly ski in and out ! In the center of the largest ski area of Europe. 5 minute walk to kids ski school. Notes on accommodation: Free wifi internet access. Outside: Two balconies with panoramic views. Utility Room: Ski and (warmed) skiboot storage. Cleaning / Towels / Linen / Maid service: Towels and linen are included, also the cleaning and service is included. The apartment is in a great ski in/out location, with an excellent large ski locker with heated boot rack. The layout is perfect for 2 families and it had everything we needed. We found some of the sheets were a bit small for the beds so the agent said he would look into that. It is also a bit tricky to find on arrival, when you turn right in the Antares building the Aster entrance is before the bridge to the next building and not after as we were directed by someone at the reception! I wasn't sure how the transfers from the welcome area to the apartment would work, but there was no need to be concerned because it's very well set up and they are very regular. Just find the Aster sign and someone in a yellow vest will help you out. The views from the apartment are fantastic and the sunsets were out of this world! A lovely place to sit in the sunshine with a drink after a days skiing. Avoriaz is also a superb resort with something for everyone. We particularly like the Lil Stash and La Chappelle jump areas. All in all a great apartment in a great resort which I would highly recommend. 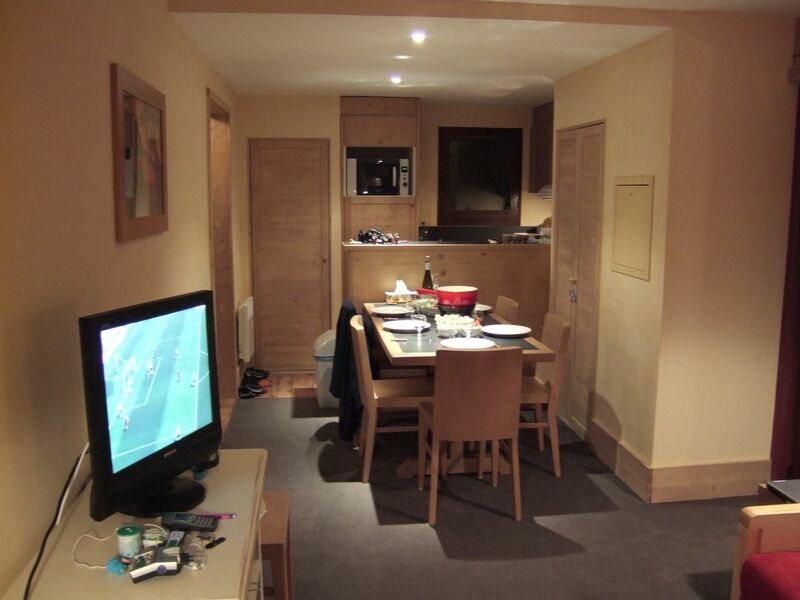 Christine and David's apartment is in a lovely elevated position in Avoriaz. Using the public elevator makes it very easy to get into the heart of Avoriaz within 6 or 7 minutes on foot. The apartment has 3 good-sized rooms, 2 with gorgeous views of the village and beyond. The kitchen is well-stocked and the bathrooms clean with plenty of hot water. There is a washing machine which is very handy and a drying clothes horse for wet ski gear. The ski locker is very generous and big enough for 6 or 7 pairs of skis if not more. There are sledges as well if you come with children. We loved staying here and have requested to book again for 2020. A well maintained apartment , well furnished, excellent kitchen equipment, we fed 12 one night and there was enough plates and cutlery for everyone.Bedrooms all adequate, storage good. The owner provided good information both before our arrival and in the apartment. The apartment was very clean except for the extractor fans in both bathrooms which were filthy. The check in and check out process was very smooth. I would definitely recommend this apartment to a friend. Perfect location - overlooking all of Avoriaz! 9 people may find it a bit cramped!!?? Thanks a lot for the review. Hope to see you again in our appartement! Apt is comfortable, clean and has everything you need to self cater. Avoriaz is very expensive, so we ate in quite a bit. The views from the apt are amazing. Ski in Ski out. Access to resort centre is by 2 public elevators, which open right beside supermarket, restaurants and bars. We were party of 2 couples. The main bedrooms and bathrooms are split by living area, so offers privacy. Would sleep 6 comfortably, up to 9 would be a tight squeeze, but if on a budget, more than acceptable. Had a great week skiing lots of variety and lovely horse drawn sleighs. Apartment had its own heated ski and boot storage which was great. Apartment was spacious and clean and accurately described although the only oven was incorporated in the microwave. The owner was contactable and provided good customer service. We did have problems trying to find the apartment, especially carrying bags and skis, as there were not any signs showing for the building, but easy when you know how! The agency was very good though and came to meet us. One bedroom was quite dark so we borrowed a light from the lounge. Enjoyed playing games and cards and also enjoyed a drink at the bar near the bottom of the lift - always welcome! Great ambience!! Airport Geneva, 50 minutes by car/bus. 5 minutes (partly covered) walk to shops and restaurants in the centre. Ski school and Village-d'Enfants (skischool for kids) within 5 minutes. Lots of good restaurants and shops. Also new tropical swimming pool "Aquariaz" and spa. Changeover Day: Saturday leave before 10am and arrival from 4pm.